I tried the 'Naupactus' scenario. It actually refers to the battle in the Gulf Of Patras. The first problem is how to set up. No guidance is given apart from it is a battle 'in the open water'. I tried with the Athenians starting behind, but they have to start close or they lose some of the 6 game turns just to catch up and get in position to strike. If the Athenians start facing the Spartans then a massacre occurs... I resolved that the Spartans are best deployed in the centre of the table on an axis to which the Athenians deploy at 90 degrees12 inches away - or maybe 3 d6 inches away ? 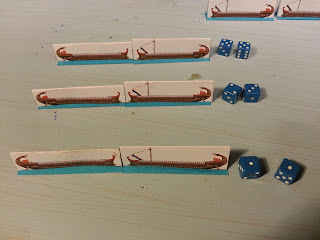 The problems of the small size of the scenario - 1 Athenian unit, 3 Spartan - means the dice roll for initiative is important for the Athenians each time and the Spartan can freely move two units each turn without immediate retaliation. The Athenian must attack the end of the Spartan line to avoid this advantage. 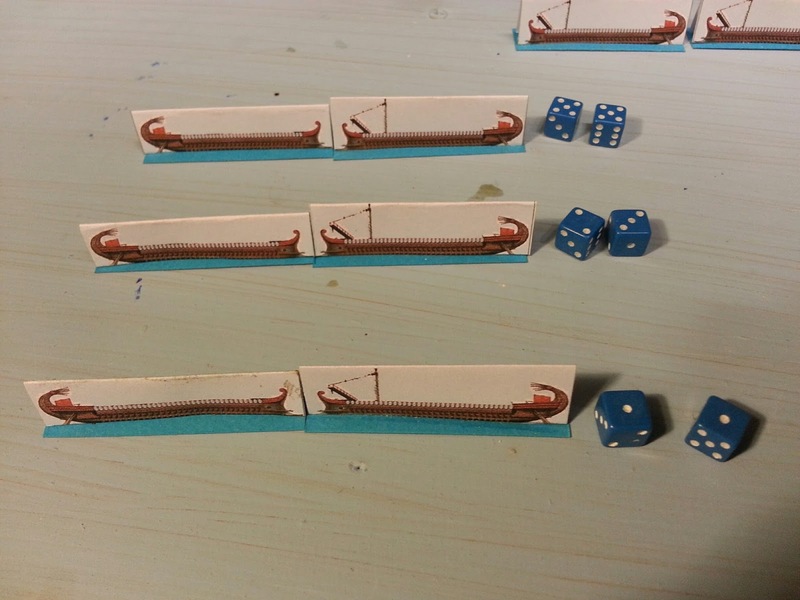 In this scenario the Athenians have fast triremes and are led by Phormio. This gives them a move of 7 inches. The Spartans can move 5 inches. Under the rules the Athenians cannot initiate boarding with their epibatai but the Spartans can - no allowance given for the extra troops on some of the Spartan ships. This means the Athenians will not bother to grapple and board, just ram. This complicates matters further, because, when rammed, fast triremes cannot be sunk - they always survive. ( or maybe they always sink? If I understood the rules wrongly?) - they have a saving roll of 0. They always survive a ram attack. This means the Spartans can only successfully kill an Athenian ship by boarding and killing its marines. The Athenians can have oars knocked off If a side attack can be made but that gains the Spartans little. In the 4 battles I fought the Spartans never sank or damaged an Athenian ship - good result. Historically accurate in that the Athenian ships were faster and more skilled and could avoid their heavier opponents. On the other hand, the Athenians won each time by game turn 4 or 5 they had sunk 5 Spartans. The trick for the Athenians was to get any ram attack in and then the Spartans need a 6+ on a d6 to survive. Attempts by the Spartans to do the historical thing and face-down the Athenian ships bow-to-bow do not work because the Athenian attacks are still effective 5/6 times. The historical result was that the Athenians captured 12 Spartan ships and sunk many more, the remainder fled. I hope you have a bucket under your table when you play these rules, to catch the blood and smashed ships. The rules are basically. I-Go-You-Go, unit by unit. Combat is instantly resolved with no carry-overs to the next round. You can drink and play this game with no problems. The blurb's 'integrated turn system' with special powers is not apparent after a few trial games. Record keeping is necessary to monitor damage but it is minimal and can be accomplished with markers. 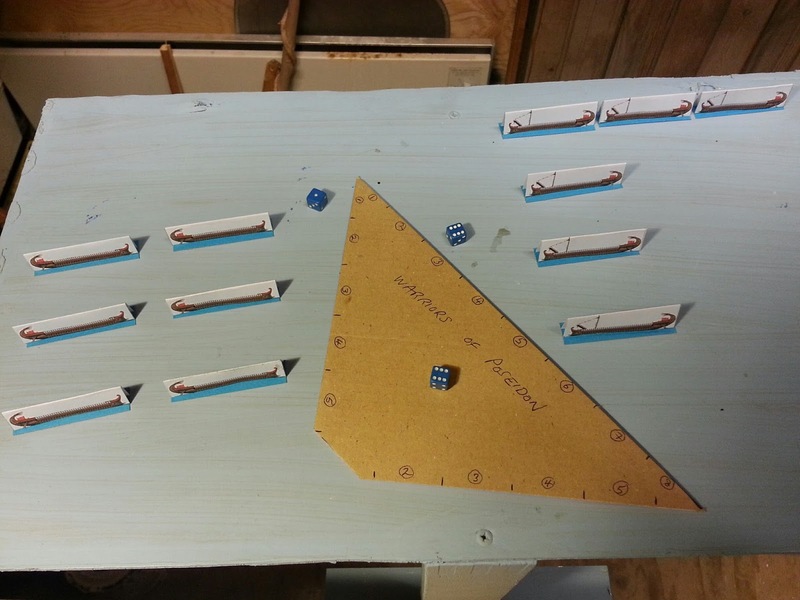 Ships move in the order of 6 inches a turn. Turns are accomplished by pivoting on the spotup to 45 degrees for each inch advanced. Units can also 'turn-about' on the spot - even if they lie alongside each other? Backing is only allowed at a minimal rate. No other special manouvres are possible. This is a problem if one considers evasion to be an essential tactic - especially before the Roman era or with small ships. Ships could turn and run before an opponent but this is not possible here unless one trusts to the vagaries of the movement sequence to stay ahead of a pursuer. An attack always goes home - the attacker never baulks, the target never flees. THE MEASURING TRIANGLE ALLOWS TURNS AND MOVES TO BE DONE EASILY. 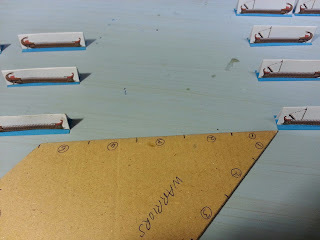 THE 1 INCH SIDE IS TO ENSURE 1 INCH SPACE TO MAKE TURNS. Each class of ship has a 'Slow' and 'Fast' variant but no 'standard'. Maybe this avoids some complication. Command and Control is by keeping units of 3 to 5 ships together. A single larger ship can form a unit by itself. Mixed units are not allowed. Commanders with special abilities allow extra tactical possibilities. Combat uses a d6 and some ship characteristics give +/- modifications. Artillery , fire pots and corvii are featured but no distant shooting by deck troops. The number of deck troops is reduced down to a few factors but is not related to ancient numbers. 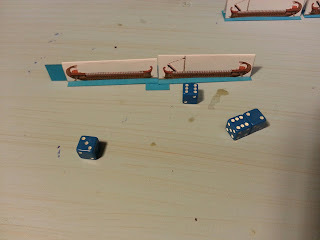 A trireme with 12 epibatai seems to get 1 factor and a Roman 5 with a century on board gets 2. Playing a few trial games showed up the usual problem of this turn structure. If one side has more units it always gets the extra initiative of saving good units to move last. This type of movement also means a player watches as a unit gets smashed by the quick bloody combat then may try to send in a response unit to smash the victors. who, in turn get smashed and then another unit is sent in to smash the victors etc. Head-on ramming by similar ships tends to sink most of each side. Avoid it. But it was a usual tactic in the later era and with heavier ships - just do it against lighter vessels and you will succeed. A fleet must check morale when things are going badly and a simple modified dice roll can end things. No table-top layouts are shown in the book and no maps or diagrams of battles at all. This is probably an omission for a book aimed at gamers starting in this type of wargaming. Not even a photo of a game in progress. No help is given with terrain. If this is a beginner's book then this is an omission, especially as the terrain is a bit specialised for this kind of wargame. Osprey seem to always have editing failures like this. The editors do not know what they are editing. If one had read the book they could have noticed these omissions? Also, Guiseppe Rava is given credit for providing illustrations reproduced from other Osprey titles but two of Peter Dennis' illustrations entitle him to no such mention. An editor's job ? Also, there is a contents list but no index. The best part of the rules, in my opinion, is that players are not left dangling, trying to think up a battle situation to fight-out. From a single battle to a generic scenario to a basic historical campaign players can find an excuse for a scrap that stops them turning to science fiction. All to the good. The basic historical background also aids gamers new to the period from going to far astray. 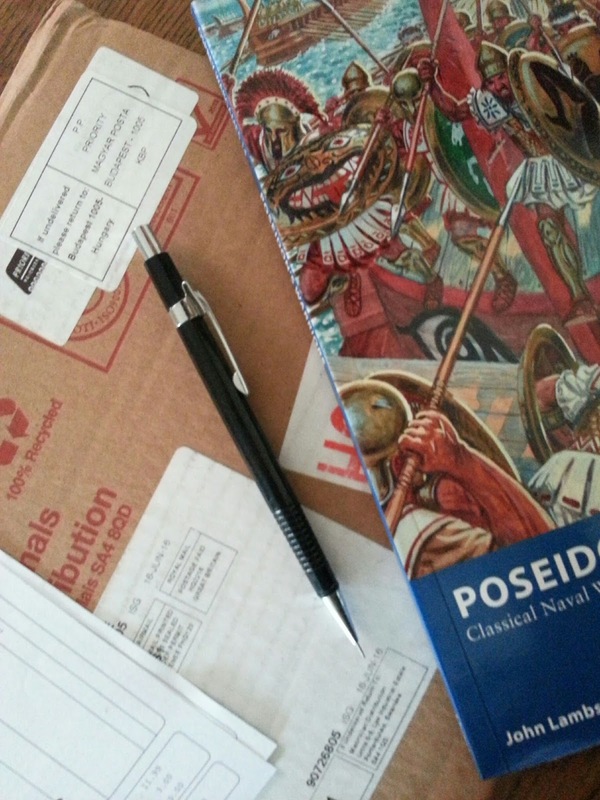 THE MARINES NOW FIGHT AND THE 2 DICE OF THE 'SLOW' 5 KNOCK-OUT THE ONLY PUNIC MARINE FACTOR ON THE 'FAST' 5. GOODNIGHT VIENNA. IN THIS LITTLE FIGHT 5 OF 6 SHIPS WERE LOST. 2000 MEN FOUND A WATERY GRAVE. 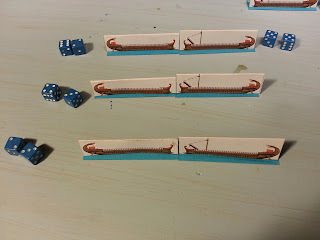 A few oddities include the compulsory slowing of a ship equipped with a corvus - not necessary for a load equal to a small handful of deck troops, surely.In the Punic Wars scenarios we are not informed which ships have corvii. There are no rules for the tactic of deliberately beaching to avoid sinking by superior enemy and no rules, even elementary, to disembark troops or fight on land. The fastest ship is a 'four' - ancient sources and research would suggest the trieres is the fastest possible ancient oared ship. An oddity is that a ship can sail across the wreck of another, even a 'polyreme' ? The Corinthian modification of reinforced bows is ascribed to the Syracusans.. There were three battles at Artemesium between the Greeks and Persians not one, and the battle at Arginusae has been widely written about but the account here lacks detail. I would recommend the rules for a conflagration at 1/1200 or even 1/3600 scale. 1/300 or larger games need more detail than these rules provide. I had battles with up to 56 1/1200 ships and could manage it. Several players could refight an ancient battle with many ships. The question mark hanging over the rules is whether they give a good representation of an ancient galley battle. ('Classical' galleys ?). I do not think they do but they do make it possible to fight the melee-type battles between Romans and their enemies without getting too confused and get a result. More mobile type of tactics will not be possible. The historical campaign are an excellent feature. Players could extend this idea in several ways to make games interesting and connected. I am currently setting up a harbour battle and will do a short report on that too. A file to print and make the simple models I used for my battles with these rules is HERE. I normally use 1/3600 or N-Gauge or 1/400 models. I played two games with tens of ships a side, including an Arginusae refight. The results were easily predictable. With the kind of mechanisms in these rules only statistics count. There are no rules to encourage or allow manoeuvre and so a sloging match is the best tactic. If one just sets ones ships side-by side then the progress of the engagement is easy to see. A second rank will ensure victory at that point. The best aspect of these rules remains the campaign aspects. Jazz-up the rules to make the battles more interesting. I was pleased to see this title emerge because galley warfare gets too little attention in my opinion. It was a bit wierd, however, that I saw so little discussion on the web or in Osprey marketing before about February this year. Why keep it a secret so long ? The book is in the usual Osprey soft-back format and is 64 pages with colour illustrations and photos. The illustrations are all from previous related Osprey titles. 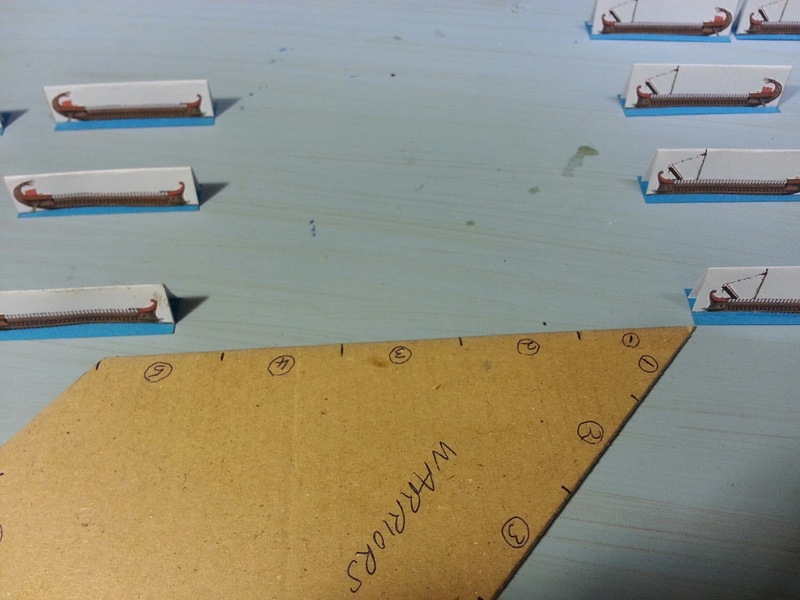 Most of the illlustrations show combat or combat situations.The miniatures photos are of Langton Miniatures ships exclusively and most are provided by Langton Miniatures. There are no photos of a game in progress and a single one which purports to show an action. This made me a bit uneasy because the book also lacks any kind of play-through or battle report from a game. Maybe I hanker for the good old days of worked examples too much ? Despite the break-throughs in digital and optical technology of the recent 100 years the photos are mostly not sharp. The book is divided into a battle rules section of 22 pages and then three sections on how to create an on-table battle which is a one-off or linked by simple 'campaign' rules. Historical information is given as needed, including a timeline and explanations of which end is the pointy one etc. There are some quibbles possible here but bear in mind it is a slim volume. The core of the book is the rules and these are clearly stated and a quick-reference sheet can be copied out. The best feature of the book, I found, was the second section which gives three ways to set -up a battle. A one-off tabletop encounter, generic scenarios such as 'Invasion' or 'Harbour Break-Out' and historical engagements based on ancient battles and campaigns. The idea with the latter is that all engagements of a period are played and a points table kept to see who is victorious overall. Simple but, importantly, do-able. The wargame these rules create is to 1/1200 scale with an indeterminate time-scale which would appear to be about 1 minute., and players will deploy 'on average' 6 or so squadrons of 5 ships. That is 30 models per player per side. This does not get up to the hundreds of the big battles but should allow smaller engagements to be done 1:1. I was therefore surprised that the scenarios given reduce the real ship totals to 1/3 to 1/12 of the original number of vessels. Is this stating from the outset that the rules cannot support a true refight ? or, maybe trying to say a scaled-down and cheaper refight is possible with these rules. The battle rules themselves group 5 lesser ships or 1 larger -'6's or greater - as a unit. Simple ship records must be kept but it is not beyond the wit of an average player to use a marker system - hopefully better than the horrendous 'gem' markers the author suggests. I find these make my eyes bleed, in the context of an historical miniatures game with decent terrain, only slightly less than the Liquorice All-Sorts on pylons used by Olicana Lad in his games. Without going into detail, the rules are straight-forward, use a D6 and ship status comprises 'oar banks', 'hull damage' and marines on board. The alignment of a ramming attack within certain arcs allows a retaliatory ram or possibility of hitting oar banks or not. Ships must grapple before attempting a boarding attack. Combat is quick and bloody. Dead ships vanish to keep the battle area clear unless you want to use the optional 'debris' rule. Control is exercise by 'command distances' and split units are to be avoided. Admirals can add their own special strategems and abilities to a fleet. I am a fan of manouvere in galley warfare. At this scale it is limited. In these rules it is basic. Movement is by pivoting on the ship's centre. All ships turn at the same rate. Surprisingly, the fastest ship is a 'fast' quadrireme. Ships from a 'Light Galley' to the astronomical 'Forty' are catered-for. Diekplous and Periplous are commented-on as possible tactics but there are no special rules to help implement them. Better ships have more movement distance. Harpax, corvii, artillery and Rhodian fire pots are all here, the only things I noted as wanting were Athenian 'dolphins' and fire as a weapon for Non-Rhodians. I will have a few battles with the rules and report them here too. This scale is not for me due to the fact I feel it neither allows representation of marines and crews and ship manouvering nor the large numbers of ships to refight ancient battles. A major negative point for me was the strange promise given in the blurb. Who writes these ? It do say ' the rules use an integrated turn system to allow a commander to position ships to go in to ram without being rammed in return, or to employ feints and traps to tempt the enemy out of position and leave his ships vulnerable to a follow-up strike.' It turns-out that the 'integrated turn system' is an I-Go-You-Go with priority decided by a dice-throw. The other stuff is nowhere to be seen. It may lie 'between the lines' or be revealed in play but this seems to be hype of the oddest kind. The proof of the rules lies in the sinking of enemy ships, so that is what I will attempt tomorrow..
At this point I would say the rules seem workmanlike and do not try to confuse the issue of a naval set-to with too many bells and whistles. All to the good. In addition, the book provides the nice feature of setting tabletop scraps in context. After a month and 5 days - a record for Fishy Eagle - I got to see Poseidon's Warriors, John Lambshead's galley wargame rules. I will do a precis and review shortly. Some of the delay may be explained by the fact that the book came from Hungary ? WT? Maybe globalisation creates this kind of economic wierdness. Osprey claimed the delay could be beacuse of customs problems - between Hungary and Denmark ? God help us when UKexit actually happens and the costs and delays of real customs kicks-in.